It's 23 years this month since Michael Flatley, Jean Butler and a huge ensemble of Irish dancers, singers and musicians wowed an estimated 300 million-strong Eurovision Song Contest television audience with the Riverdance routine which is still remembered today as it heralded in a whole new style of dancing. The interval entertainment that Dublin night back in April 1994 certainly left a lasting impression on me and last night (Tuesday), I came away from Milton Keynes Theatre having enjoyed a similar experience after watching another Michael Flatley spectacular, Lord of the Dance: Dangerous Games. In celebration of 20 years since Lord of the Dance: Dangerous Games made its debut at the Coliseum in London's West End and, having recently finished a successful World Tour, the show is now on a UK Tour and Flatley has certainly pulled out all the stops. It's hard to actually describe the Dangerous Games storyline – much as it is in trying to describe Andrew Lloyd Webber's Cats! – save to say that good gets to triumph over evil in a show which features fabulous sets against a wonderful and colourful filmed backdrop, lavish costumes and the most amazing footwork that you will ever see. It truly is one hour and 40 minutes of intoxicating pleasure, the mix of dance and music ensuring that the whole audience either clapped or shuffled their feet in time to what is an hypnotic theatrical experience… it really blew me away! Although the lead performers often switch between performances, the gymnastic part of the Little Spirit is superbly performed each time by former British tumbling champion Jess Judge dressed in a fetching cat suits which seemed to glitter all the colours of the rainbow under the stage lighting. Then there was talented Welsh songstress Sophie Evans who performed three outstanding numbers as Erin the Goddess, her voice reminding me of Céline Dion. And if watching two beautiful girls playing fiddles while dancing around the stage on high heels is your thing, then witnessing and listening to the stunning performances of Nicole Lonergan and Giada Costenaro Cunningham is worth the price of a ticket all on its own! The other key parts at Tuesday's opening night saw Nikita Cassidy as Saoirse and Andrea Kren as Morrighan while the rest of the 40 strong cast were absolutely magnificent, their energetic and intricate dance steps and amazing techniques totally mind-blowing, the whole experience of those tap routines being somehow enhanced, thus making the overall sound even more remarkable. In fact the dance routines are so amazing and typically Irish that I wouldn't have been surprised to see The Corrs, Enya, Daniel O'Donnell or Eurovision star Johnny Logan pop out from the wings and join in the choruses! Added to the overall colourful spectacle, some of costumes might have been borrowed from the set of Stars Wars – or even Doctor Who! – while I'm still baffled as to how anyone could learn such dramatic and exacting choreography that Lord of the Dance requires, let alone all do it in such an accurate synchronised manner, it's beyond comprehension. As for the originally score, composer Gerard Fahy's music complements what is undoubtedly the finest dance show that I've ever seen, while the immediately recognisable Lord of the Dance number – threads of which feature throughout the show – is perhaps better known as a popular hymn penned by Sydney Carter to a tune borrowed from an American folk song… but it fits the bill perfectly! Lord of the Dance: Dangerous Games plays Milton Keynes Theatre until Sunday, 9 April with performances at 8pm each night with matinees at 2.30pm on both Saturday and Sunday. 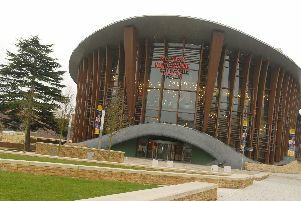 Ticket prices are from £36.25 and are available from the box office at 0844 871 7652 or online at www.atgtickets.com/miltonkeynes.